Arutz Sheva speaks with participants at Sunday's joint Israeli-Arab prayer session at the Gush Etzion junction. 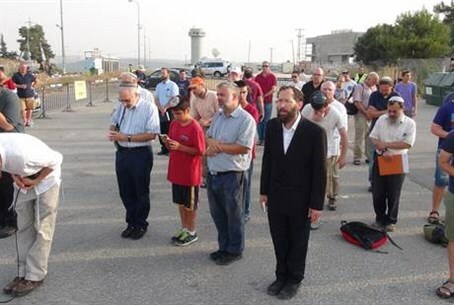 Arutz Sheva spoke with Rabbanit Hadassah Froman, widow of the late Rabbi Menahem Froman, at Sunday’s joint Israeli-Arab prayer session, in which rabbis, sheikhs, and MKs gathered together to pray and commiserate over the arson attack in the village of Duma on Friday. Rabbanit Froman, whose husband was well-known for his efforts to bring together Jews of all backgrounds, as well as fostering unity between Jews and Arabs, said she is continuing her husband’s path. “Today we have a very very important mission: To say that here, in our holy land, we are commanded to keep life, to save lives, to honor all people all around, and if something happens like the terrible things that happened in Shechem, we all have to shout and demand that it stop,” she said. “If we want to live here in this land, we have to be pure. We have to be honest and give life to everybody,” said Rabbani Froman. “What gives us hope is that the prayer today, we will have some Muslims joining us to pray together...this week on Shabbat we read the ten commandments, which include the commandment of ‘thou shall not murder’, and we hope to stand out against violence and lessen these phenomenon,” he added.